We accept PayPal, Money Orders, or cash (at your risk). All prices include US shipping and handling. Price includes shipping and handling in US. Contact us for combined or international shipping rates. 1955 BMW 512 Convertible 1:18 diecast Maisto Black with tan interior. Approximately 10" long. Opening doors, hood, trunk, adjustable seats, Adjustable front wheels, workable steering, independent spring suspension for wheels. Missing base. 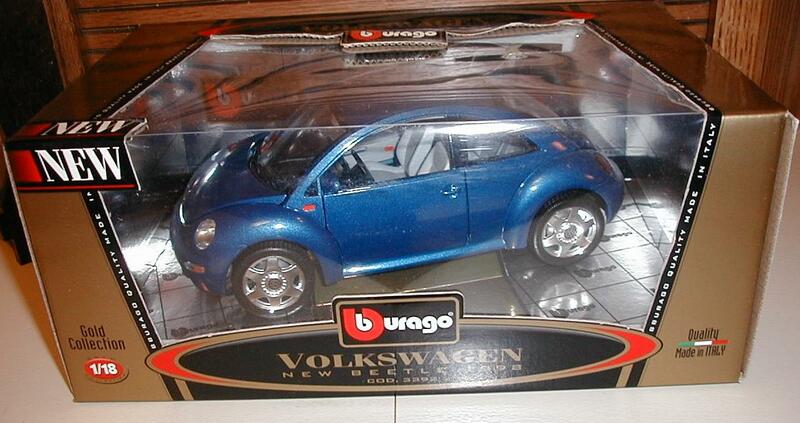 1:18 diecast Burago Gold Collection in blue metallic with grey interior. Approximately 8 3/4" long. Opening doors, hood, hatch, adjustable seats, adjustable front wheels, workable steering, independent spring suspension for wheels. Never removed from box. 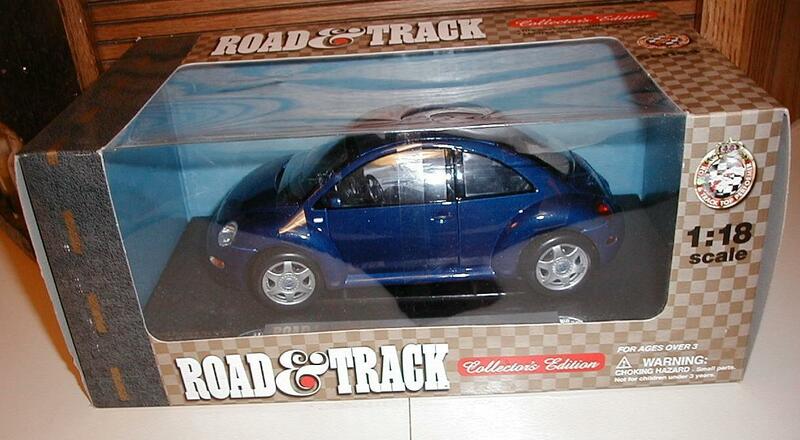 Road and Track Collector's Edition 1:18 diecast in blue metallic with black interior. Approximately 8 3/4" long. Opening doors, hood, hatch, adjustable seats, adjustable front wheels, workable steering, independent spring suspension for wheels. Never removed from box. Opel Speedster 1:18 Diecast Maisto Special Edition. Excellent detail. In box. Yellow body. Black bucket seat interior. Two seat roadster. Approx. 7 3/4 inches long. Opening hood, trunk, and doors. Adjustable wheels and steering. Independent spring suspension for wheels. Chrysler Pronto Cruizer 1:18 Diecast Maisto Special Edition. OCV (Original Concept Version) Excellent detail. In box. Bright gold metallic body. Charcoal bucket seat interior. Approx. 8 3/4 inches long. Opening trunk and doors. Adjustable wheels and steering. Independent spring suspension for wheels. 2004 copyright Lexus SC 430 two door coupe 1:18 Diecast Maisto Special Edition. Excellent detail. In box. Tan metallic body. Beige bucket seat interior. Approx. 9 inches long. Opening hood, trunk, and doors. Adjustable wheels and steering. Independent spring suspension for wheels. 1995 Alpha Romeo Spider 1:18 Diecast Maisto Special Edition. Excellent detail. In box. Blue metallic body. Grey bucket seat interior. Approx. 9 1/4 inches long. Opening hood, trunk, and doors. Adjustable seats, wheels and steering. Independent spring suspension for wheels. 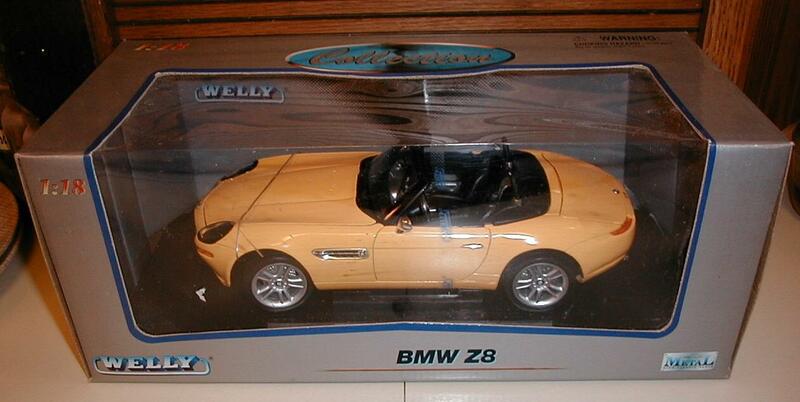 BMW Z8 Roadster 1:18 diecast Welly. Excellent detail. In box. Yellow body. Black bucket seat interior. Approx. 9 3/4 inches long. Opening hood, trunk and doors. Working front wheels, workable steering. 2003 copyright BMW 645 CI 2door Coupe 1:18 Hot Wheels. Excellent detail. In box. Tan body. Black bucket seat interior. Approx. 10 1/2 inches long. Opening hood and doors. Steerable wheels.